Purveyors of the news for the past nine years know what constitutes a "green zone": Security from suicide bombers, infiltrators, craziness of an unvetted variety, and control over troublemakers of foreign and local variety, initially probably in Iraq (now metastasizing into other war theatres). The new Greengrass, who gave us the crackling good adventure-actioners in the BOURNE canon, has done it again. Greengrass' filmography includes The Bourne Ultimatum (2007) (Germany); United 93 (2006); The Bourne Supremacy (2004); and Bloody Sunday (2002), among others in a distinguished writing, directing and scripting career. The only problem is that this is so good, so fast, so all-around-diverting that it won't have the cachet of a brand new genre come next March Academy Awards night, since THE HURT LOCKER just swept the Oscars with six golden statuettes, and the Academy probably can't risk giving the prize win to a 'war film' two years in a row. Which is a damned shame. No bummed-out Babs Streisand scowling in the middle distance in '11. 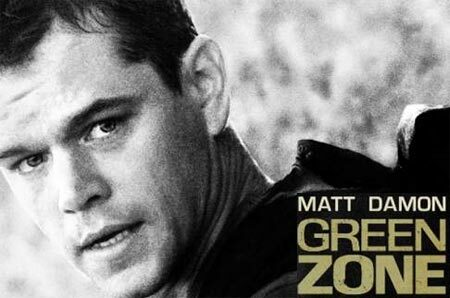 Matt Damon does a tight, riveting, subtle turn as Chief Warrant Officer Roy Miller in Iraq in 2004, serving under maximal stress and constant turf battles against such peacock-aggrandizers as smarmy Pentagon wonk, Greg Kinnear, who (as Clark Poundstone) wants results at all costs, no matter their veracity. Brendan Gleeson, the magnificent Irish actor, turns in a pitch-perfect perf as the Sunni- and Shi'a-hound CIA detail man who wants the practical results that will produce lasting Iraqi peace and sanity, not fleeting WMD glory. The sole female figure is a revenant who, unlike brunette Judith Miller working for the NY Times, is here blonde (Amy Ryan, playing Lawrie Dayne) and working for the Wall Street Journal. Both newsies get info they perhaps too-easily swallow. The plot, which is challenging to hear and see amid the blur of action and overlapping dialogue and split-hair edits and cross-cutting: Discovering covert but consistently faulty intel converts a solid U.S. Army Captain to go rogue as he hunts for Weapons of Mass Destruction in an unstable region. Miller thinks there's a stinkweed in DC misdirecting all his crew's efforts, wasting their time digging in ludicrous places and uncovering innocuous toilet factories planktoned in pigeon poo. Turf battles with home office, Kinnear and parachuted-in fake Iraqi puppet masters interfere with and clash with the maddening unknown of which locals can be trusted, which cannot. Mistakes result in families being wiped out-or US Armed Services personnel buying it. Filmed in Spain, morocco and the US, the film has the gritty feel LOCKER has, the narrow alleyways, the impassive faces of the ex-Saddam Army, all of whom turn in excellent portraits of proud, fearless, passionate (if nuanced-loyalty) soldiers. Testosterone rises right out of your seat into your chest as Damon chases leads to what's what in WMD. It's not a blatant play for partisan hoorah! Either. One rides along in the Humvee or military transport with heart racing and knuckles clenched. Green Zone gets a bright green light from this seat.